i may get all of these things accomplished before/if i have a third child, i might not. one thing i know is that if i never start- i'll never finish. so, i started work on my first goal. swimming from alcatraz to shore. 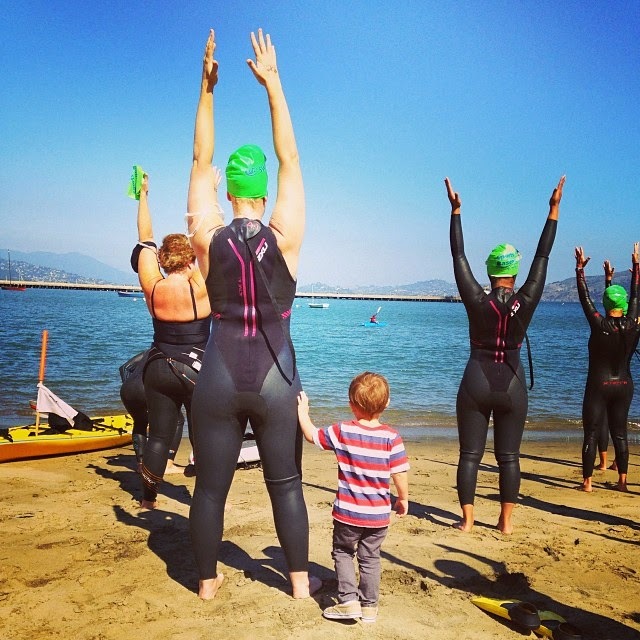 i have always wanted to do this swim and we live so close to san francisco- it felt so…doable. i've started training and i feel great. swimming is like first nature to me, it's my happy place. one thing that really helps me (with any challenging feat) is having a goal in mind. getting to shore seems like a pretty good goal, not getting eaten by sharks- another good one; but those didn't seem sufficient. i needed something more... emotional. i decided to dedicate this swim to my dad- who loved to watch me swim. i have been donating money every month to an organization whose main mission is to provide funding to dementia and alzheimer's research. that, i thought, was the perfect goal for my swim. i will try to raise money in my dad's honor to help fund research for the very disease that took his mind and his life. losing my dad was the hardest and most devastating loss i have ever felt. watching him suffer for years, knowing himself, that his mind was slowing fading…it was so painful. i know that there is much work and much money to be raised, to one day eradicate dementia. but this is one small way that i can help the cause. if you would be so willing, i could really use your support. below is the link to my fundraising page where anyone can donate ANY amount. thank you in advance! i'll let ya know how the swim goes!